LOS ANGELES — There was nothing new about what Clayton Kershaw did Monday night, but there was a twist at Dodger Stadium. Kershaw dominated through eight innings but the Dodgers could not hand the ball to Kenley Janson, who is on the DL with a heart issue. The Giants took full advantage, scoring four in the top of the ninth for a stunning 5-2 win in the first game of an important series. 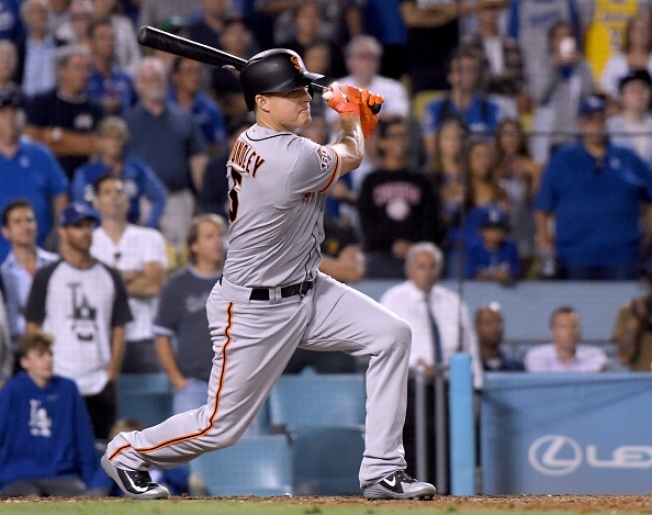 Nick Hundley’s single with two outs and the bases loaded flipped the lead and the Giants kept tacking on, once on a Gorkys Hernandez single, once on a Dodgers error. When they were done, they were back to .500 at 60-60, and just four back of the Dodgers. They are five games behind the Diamondbacks. --- Kershaw allowed just one run, but Dave Roberts turned to Scott Alexander in the ninth. With one out, the Giants got singles from Chase d'Arnaud and Buster Posey. Two batters later, Austin Slater was drilled, loading the bases. That's when Hundley came through. --- Brandon Crawford was removed in the fifth, a few minutes after a nasty collision with Gorkys Hernandez. The two ran into each other while chasing a Kershaw pop-up that went for a double. Crawford hit in the top of the next inning, but didn’t take the field after that. He appeared to hit his head when he ran into Hernandez. --- Madison Bumgarner did his part to make this matchup a solid one. In six innings, he allowed two earned on seven hits, repeatedly working out of traffic. Bumgarner struck out four and walked two. One of the runs scored on a bloop with two outs, the other on a Justin Turner homer. --- Steven Duggar wasn’t all that impressed with Kershaw, apparently. The rookie had an infield single in his first at-bat and smoked a single to right his second time up, coming around to score two batters later. He struck out the third time up. --- Ray Black’s first appearance against the Dodgers was a dominant one. He got Joc Pederson to ground out and then blew Chris Taylor and Yasiel Puig away. --- It’s a small thing, but Kershaw runs out grounders harder than half the position players in the National League.